(http://www.MaritimeCyprus.com) On 1 June 2018, at about 0035 Eastern Standard Time, the Liberian-flagged container ship YM Efficiency (Figure 1) lost 81 containers overboard in gale-force weather conditions. At the time of the container loss, the ship was about 16 NM east-south-east of Newcastle, New South Wales (NSW). The occurrence also resulted in damage to a further 62 containers and structural damage to the ship’s gangway, superstructure and lashing bridges. The ship was on a regular service, calling at ports in China, Taiwan and Australia. YM Efficiency is a 268.8 m-long, 4,250 TEU container ship, registered in Monrovia, Liberia. The ship was owned by All Oceans Transportation, Liberia and operated by Yang Ming Marine Transport, Taiwan. At the time of the incident, the ship was classed with the American Bureau of Shipping. On the afternoon of 13 May 2018, YM Efficiency berthed at the port of Kaohsiung, Taiwan. About an hour after berthing, the loading of containers on board the ship commenced and just before midnight, cargo operations were completed. Shortly after, YM Efficiency departed Kaohsiung for Port Botany, NSW, Australia, with a maximum draft of about 12.6 m aft. On departure, the ship’s passage was executed to achieve an expected time of arrival at the pilot station off Port Botany at midday on 1 June 2018. During the passage south, the ship’s crew received regular weather forecasts and advice to assist voyage planning, as part of a commercial weather routing service. By the afternoon of 29 May, the ship was off the coast of Brisbane, Queensland making good an average speed of about 9 knots. By this time, the ship’s crew had also begun to receive weather data broadcast by Australia’s Bureau of Meteorology (BoM). 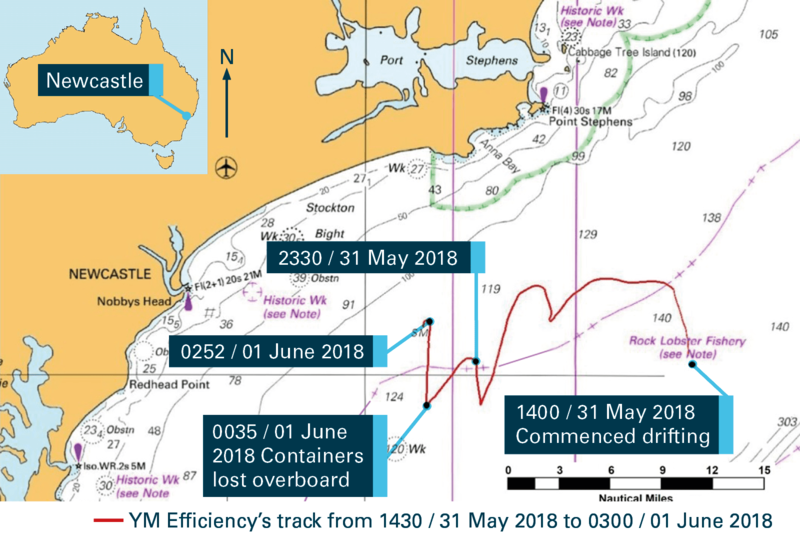 By 0930 on 30 May, YM Efficiency was off the coast of NSW, about 32 NM to the north-east of Coffs Harbour. Weather forecast information received on board predicted steadily increasing winds and seas into the next day. Between 0930 and 1130 that morning, in preparation for the expected heavy weather, the chief officer was charged with carrying out checks in accordance with the ship’s heavy weather checklist. This included a check to ensure that container lashings on deck were secure, which was subsequently completed. By 1200, the ship was off Coffs Harbour with the weather recorded in the ship’s logbook as being west-south-westerly winds at force four (between 11 and 16 knots) with 3 m seas and 2 m swells. At 1605 on 30 May, BoM issued coastal waters forecasts for the Macquarie and Hunter coasts of NSW. Both forecasts included gale warnings for the next day, 31 May, caused by a low-pressure system moving east over the Tasman Sea for the next few days. By 1900 on 30 May, YM Efficiency was off Port Macquarie and the weather had deteriorated. The weather was recorded as being cloudy with west-south-westerly winds at force eight (between 34 and 40 knots) with 6 m seas and 5 m swells. By 0800 the next morning, 31 May, the ship was about 32 NM east-north-east of Port Stephens. The weather was recorded as being cloudy with west-south-westerly winds at force eight (between 34 and 40 knots) with 7 m seas and 5m swells. The ship’s main engine speed was set at 35 revolutions per minute (rpm), the equivalent of ‘slow ahead’. At about 0830, a second heavy weather checklist was completed, with the container lashings checked once again. At about 1300 on 31 May, the ship received information that the pilot boarding time for the ship’s call at Port Botany had been delayed by 8 hours to 2000 on 1 June. At about 1400, the ship’s main engine was stopped and the ship commenced drifting off the NSW coast, about 30 NM east of Newcastle (Figure 2). The weather at the time was recorded as being overcast with west-south-westerly winds at force eight (between 34 and 40 knots) with 6 m seas and 5m swells. The ship’s main engine was re-started for brief periods over the next few hours to maintain some control over the ship’s drift. The rough weather continued into the evening with the wind recorded as having increased to force nine (between 41 and 47 knots) at 2200. At about 2330, the ship’s main engine was started with the engine speed set to 35 rpm and the ship’s head was slowly brought around to the south-west to resume the passage to Port Botany. At midnight, the third officer handed over the navigation watch to the second officer. By this time, the ship was on a heading of about 210° with a speed of about 4.3 knots. The weather at midnight was recorded as being overcast with west-south-westerly winds at force nine (between 41 and 47 knots) with 6 m seas and 5 m swells. At about 0034 on 1 June, in a position about 16 NM east-south-east of Newcastle, the ship experienced a period of quick, heavy rolling for about 60 to 90 seconds. The rolling was estimated by the ship’s master as having reached angles of up to 30º to port and starboard. Shortly after the start of the rolling, several engineering alarms sounded and the main engine shut down with the rpm reducing to zero. The second officer reported hearing loud noises on deck and suspected that there had been some cargo damage. He turned on the ship’s deck lights and observed that containers had been damaged and possibly lost overboard from the bays aft of the accommodation. By about 0036, the rolling had reduced and the ship’s motion had calmed. By this time, the master had arrived on the bridge and the chief engineer and second engineer had proceeded down to the engine room to assist the duty engineer with the main engine shutdown. The master took over the navigation of the vessel and instructed the chief officer to conduct a damage assessment. At about 0040, the chief officer reported several containers damaged or lost overboard from bays 52 and 56, just aft of the accommodation (Figure 3). At about 0045, the main engine was successfully re-started and the engine telegraph on the bridge was placed at ‘dead slow ahead’ and then, almost immediately, placed at ‘stop’ again. The ship continued to drift in the gale force winds and seas until about 0252, when the main engine was started and the ship resumed passage for Port Botany. In the morning, the ship’s crew conducted more detailed damage assessments and attempted to stabilise the damaged and collapsed containers on deck. The container loss and damage was found to be limited to bays 52 and 56. The container loss was reported to the Australian Maritime Safety Authority (AMSA) who coordinated notifications to other involved stakeholders. AMSA also commenced modelling the drift of the lost containers and initiated safety broadcasts to warn shipping in the area of the hazard posed by the lost containers. Over the next few days, AMSA, along with Roads and Maritime Services, NSW, continued to work with the ship’s owners and insurers to detect, identify and track containers and their contents on the NSW coast. Although there were a considerable number of damaged containers still on board the ship, no further containers were lost overboard after the container loss event on 1 June. The ship sustained damage to the gangway, superstructure and lashing bridges. YM Efficiency eventually berthed in Port Botany at about 0936 on 6 June. Over the course of the following days, personnel representing several different stakeholders attended the ship including investigators from the ATSB, AMSA surveyors and the ship’s flag state – Liberia. On 11 June, the first damaged container was discharged from the ship and by 21 June, all remaining damaged containers had been discharged. YM Efficiencydeparted Port Botany for Melbourne at about 2130 on 22 June. The investigation is continuing. The ATSB will follow any location and salvage efforts to identify any further evidence should it become available. analysis of weather conditions at the time of the incident. Typical big ship small captain totally preventable loss.